Hello! I’m Judith and I’ve recently joined the LHSA team as a conservation intern. I’ve moved to Edinburgh for 8 weeks from Newcastle, where I recently completed a two-year MA in conservation of works of art on paper at Northumbria University. During my internship I will be working with a range of material from the archive, including photographic materials, architectural plans and bound volumes, as well as rehousing several collections. This is my first real foray into a large archive and the past two weeks have been an eye-opener! 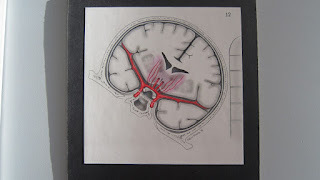 In preparation for rehousing, together with Claire (LHSA archive intern) I have been surveying the collection of medical illustrations, demonstration boards, sketches and photographs generated through the practice of the great Edinburgh neurosurgeon, Professor Norman Dott (1897-1973). 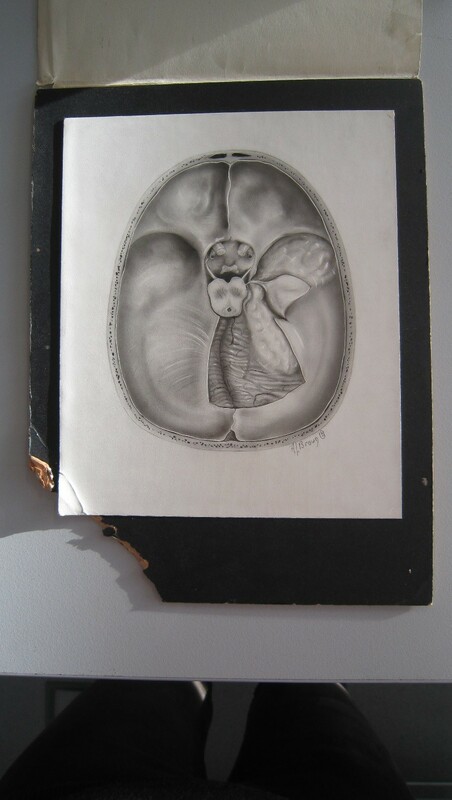 Dott emphasised the importance of good medical illustration and used professional medical artists to document his work and publications. Medical artists were held in high regard during this period; in more recently years this has largely been superseded by photography. 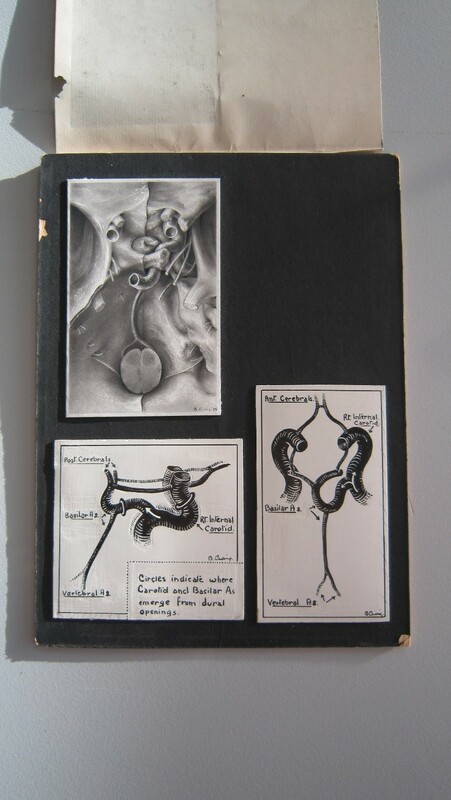 Amongst the fascinating range of illustrations in the archive are 70 carbon dust drawings of clinical procedures. 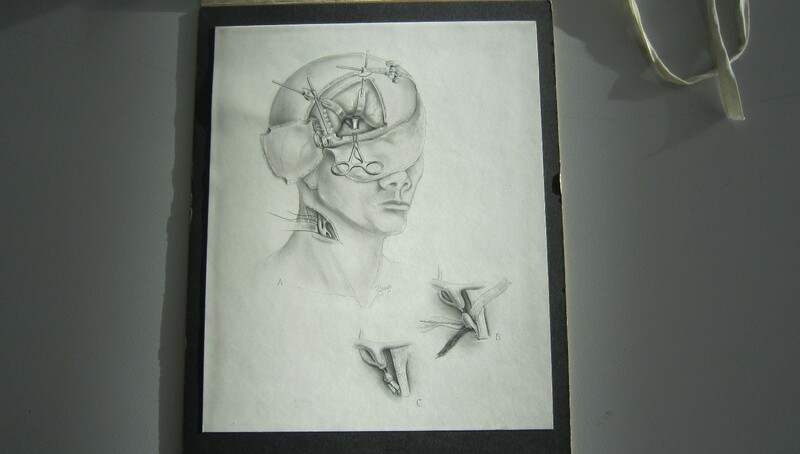 Having never come across drawings like these before I thought I would share some of what I have been discovering. Pioneered in the early 1900s by Max Brödel (1870-1941), medical artist at the John Hopkins School of Medicine, Baltimore, carbon dust drawing was used to produce clinical images representing anatomical detail. The technique allows for a wide variation in tone, shading and highlights, to display a range of textures, making grey-scale, tonal illustrations look like living tissue. Small board with three drawings of details of the brain. The carbon dust drawing is top left, demonstrating the tonal variations possible compared to the line drawings in pen below. Artist: B. Craig, 1939. In the early twentieth century the Philadelphia lithographer Charles J. Ross invented Ross Board, which was a board consisting of a paper or cardboard substrate with a thin layer of approximately 1/32 of an inch of finely ground white chalk (often gypsum) mixed with a binder. The chalk mixture was applied to the cardboard under pressure. To produce a drawing, typically an artist makes a preliminary drawing on paper using a carbon pencil, which is then reversed and traced onto a second sheet. This second sheet is placed face down on the board and the image outline transferred to the board by carefully rubbing along the lines using a flat tool or thumb nail. This ‘double transfer’ method leaves an outline image to which tone, shading and depth can be then added by brushing on thin layers of fine carbon powder. Layers of powder can be built up to produce detail or rubbed away to give highlights, and coloured details can be added in pencil or ink. Carbon dust drawings showing surgical procedures. Artist unknown. The technique began to make its way to Edinburgh when Audrey Arnott (1901–1974), an artist based at the London Hospital, visited Brödel in 1932. On returning to England, she passed on the new technique to colleague Margaret McLarty (1908–1996), a freelance artist who had originally trained under Professor Dott. 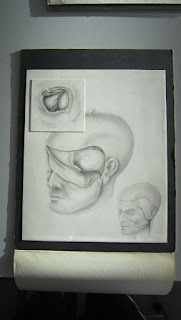 Hester Thom, a Canadian artist and another of Brödel’s students, was Dott’s personal artist until 1939; she taught the technique to Clifford Shepley (1908–1980) who was appointed as medical artist at Edinburgh University in 1934. The drawings in the archive are by a number of different artists, including Thom and Shepley. A carbon dust drawing showing a brain prior to impact with a wall, with coloured highlights. Artist: Clifford Shepley, 1960. Over the coming weeks I will be rehousing these, to better protect the delicate surfaces of the drawings and make them more easily accessible. The drawings are currently stored in folders in plan chest drawers, one on top of the other. This has allowed movement within the drawers as works were removed for production to readers, leading to some abrasion to the surfaces and loss of gypsum at the corners and edges. A carbon dust drawing of a brain from above. One of the main conservation risks to the drawings is mechanical damage to the fragile, smooth surface of the gypsum, which is susceptible to scuffing, burnishing, cracks and losses. In this case, the missing corner of the black supporting board has resulted in cracks developing from the bottom left corner. Artist: Ann Brown, 1956. If you’d like to know more about these unique drawings or the progress of the project, do get in touch! Hello to new intern, Claire! Hello! I’m Claire and I’m the new archive intern working with the Lothian Health Services Archive (LHSA). I’ve volunteered with the Centre for Research Collections before, working on the Towards Dolly project, but this is my first foray into the medical collections that LHSA hold and I’m really excited to get started. For the past year I’ve been completing an archive traineeship in the Historical Search Room of the National Records of Scotland (NRS), which has given me a great grounding in the customer-facing side of archives; and I am also well-versed in the ways of family history research. I graduated in June from the University of Dundee with a Postgraduate Diploma in Archives and Records Management, and, when I finished my traineeship at NRS in September, I decided that I needed to round off my archival training with some cataloguing experience. The LHSA cataloguing internship came up and I was lucky enough to be selected to work on LHSA’s photographic collection for a period of eight weeks. With my first week drawing to a close, and some initial scoping work done, I thought it would be useful to look ahead at what I’ll be doing while I’m here. LHSA’s photographic collection is made up of around 40,000 images and includes, not just photographs, but films, glass plate negatives, slides and digital photographs. My work on the collection will focus mainly on photographic prints and their associated negatives, and slides. It will be my job over the coming weeks to work with a selection of LHSA photographic material, some of which is uncatalogued and some of which is catalogued in a legacy cataloguing system and needs updating (like the photograph above). I’ll hopefully be establishing what is held, cataloguing the material using the current cataloguing system and rehousing the material into archive-friendly sleeves and boxes. I will also be undertaking a myriad of tasks that I’ve yet to find out about, but that I’m sure will be equally fascinating given the rich history that LHSA holds. In completing this work, I will be helping LHSA make its photographic collections more accessible to researchers (students, academics and the public alike) and increasing my skill-set to help me develop my career within the record-keeping sector. Over the next seven weeks I will be helping to contribute to LHSA’s social media, so no doubt you will hear from me again and I can update you on how I’m getting on, and what interesting things I’ve discovered. Until then, you can find out a little more about the archive and our collections on our website, and if you want to see more of what we get up to in the office, take a look at some of our previous blogs.